If I was given a dollar every time I have been asked a question about Americano coffee, I would be sunning myself on a tropical island instead of writing a blog! And in this post, I want to focus on making an Americano with a Nespresso coffee machine. That’s right. I am trying to be focused. The chart below shows the best Nespresso capsules for an Americano. And for those of you who just want to buy the best Nespresso capsule for an Americano, RIGHT NOW, click here! In the first section of my article, I will deal with Americano FAQs. The fact that coffee fans have so many questions relating to Americanos, shows that this coffee drink is very popular and that there is a lot of confusion about what exactly an Americano is. In the second section, I will look at the different variety packs, shown in the chart, in much more detail. And I will finish by ranking these different packs. Legend has it that Americanos were first created in World War Two for coffee loving American soldiers who were stationed in Italy. Italians tend to drink only one type of coffee, espresso, which is very strong because there is so little water in it. A standard espresso “shot” uses 7 grams of ground coffee and 30 ml of hot water. So the legend goes, it was too strong for many American soldiers who were used to drip coffee and needed these espressos watered down. An Americano is literally a watered down espresso. But it is not quite as simple as that! There are other coffee drinks that are watered down expressos, such as Long Blacks! A true Americano is when a cup is first filled with a shot of sspresso before hot water is added. A Long Black is the opposite. A cup is first filled with hot water before a shot of espresso is gently added to it. To add a little to the confusion and complexities of different coffee drinks, espressos also have variations which sometimes get confused. A ristretto is a drink that uses the same amount of ground coffee as an espresso but it uses about half the water. A lungo is a coffee that uses the same amount of ground coffee as an espresso but it uses about double the water. It is better to say this at the start rather than to spring it on you, part way in. There is no step by step guide to making the perfect Americano which will suit everyone. There are many written guides or “how to” videos focused on making the perfect Americano and guess what? Many coffee bloggers who are giving advice about making the perfect Americano, are actually making a Long Black. If you add your espresso shot to your hot water (as you do with a Long Black) the crema (which is the thin cream colored “film” that floats on the top of your espresso) won’t be destroyed. Of course, most of this advice is not relevant because with the Nespresso capsules, our machine will be making the espresso for us. So the biggest problem facing you is choosing the perfect blend of coffee for your espresso shot. Did you know that there is only one Nespresso coffee machine that will make you an Americano from scratch? And that is the Nespresso Expert. This is the only machine that at the touch of a button will create an Americano from scratch. All other Nespresso machines at the touch of a button will create an espresso but from there you will have to add your own hot water. Yes, I know. It is an absolute disgrace! Before we can begin to talk about the best Nespresso capsules for Americano, we need to briefly talk about Nespresso machines. There are two generations of Nespresso machines- Original Line (pre 2014) and Virtual Line (post 2014) and the capsules that you buy need to be compatible with your machine. If you own or you want to buy a Virtual Line Machine you can only use official Nespresso capsules but if you own or want to buy an Original Line Machine, you have more choice because your machine will work with “Nespresso Compatible” capsules, which are made by third parties. Moving on, we can now look at the capsules themselves. Nespresso make a staggering 24 different types of capsules across different ranges. Like most coffees, these capsules encompass a broad range of different coffee beans, different strengths, different blends and different flavours. If you are looking for the best nespresso capsule for an Americano it means that you haven’t yet found the perfect one. And the only way to do this is to experiment with a bit of trial and error. *Someone who likes a bit of variety in their coffee. So, to start off let’s go with Original Line capsules. This pack is an official Nespresso product. Remember though, it will only work with Original Line Machines. It contains fifty capsules and five varieties or “blends”. Most of these blends have a high intensity which is what you will need for an espresso that you will be diluting. Importantly, these five blends all appear high up in the Nespresso Intensity Scale. This scale, which goes between 1 and 12, is a description of the temperature and duration of the roasting process. The higher the number, the darker the bean and the more bitter its taste. It doesn’t relate to the quantity of caffeine in the blend. Importantly, four of these varieties are created especially for Espressos or Ristrettos which will guarantee that your Americano will be full of flavor. The only variety that is not created for an espresso or for a ristretto is the Fortissio Lungo blend. This pack is for loyal Nespresso users. If you have always used official Nespresso capsules then this very popular product is for you. The combination of different blends is great for people who like a like a bit of subtle variety with their coffee. All of these blends will provide a very smooth and rich flavour to your Americano but it will change slightly, according to the variety. Nespresso capsules, uniquely in this comparison, can be recycled. These capsules will suit a buyer who cares about the environment and believes that recycling plays an important role in this. In this section, I have selected three top quality and very popular sets of “compatible with” capsules for Original Line Nespresso machines. An advantage of this multi- pack is that it includes two varieties that are made specifically for espresso or ristretto coffee. The Maestro Pods are made from 100% Arabica beans from Tanzania and Costa Rica. They have been roasted slowly at low temperatures. This blend is characterised by distinct hazelnut and cocoa aromas. And it has been created specifically to create perfect Lungos and cappucinos. The twenty Gentleman capsules are described as extra dark roast. Created from a combination of beans from Central America and South Africa that provide a wonderful aromatic and fruity flavor. Once again with three blends, this pack is perfect for someone who likes a bit of variety when making their coffee. Relatively speaking this pack is cheaper than the official Nespresso pack and so it would suit someone who drinks quite a bit of coffee or someone who likes great coffee on a budget. Like the official Nespresso capsules, Bestpresso have created an Intensity scale (ranging from 1 -12) to measure and described the strength of their different blends. Once again the intensity scale is a description of the temperature and duration of the roasting process. The higher the number of the scale, the darker and more bitter the “roast” will be. The advantage of this product is that it is reasonably priced and that the are ristretto and intenso varieties are very intense and suitable for making a great espresso as the first step in creating that superb Americano. Like the other variety packs in this comparison, the Lungo capsules are perhaps not intense or strong enough to create a great Americano. This is a large pack in this comparison and so it would suit someone who drinks lots of coffee or a person who wants a great coffee at a great price. This pack will suit someone who likes to make very strong espressos or even someone who likes the occasional ristretto. Two of the varieties in this pack come with highly intense flavors which will suit a person who likes their dark roasts and their coffee on the bitter side. The ristretto offers some chocolate notes for chocolate lovers and the Intenso with its berry flavor will suit “fruit” lovers. Another quality coffee producer that rates their blends on an intensity scale, this time going from 0 to 10. . The intensity of each blend is shown in parenthesis beside each of the blends. The Ristretto Blend Forte packs quite a punch with its intensity rating of 10. This blend uses Arabica beans from Latin America and Africa and a small amount of Robusta beans from Asia. All the beans combine to produce a spicy aroma and a very rich and intense body and flavor. The Messico Blend Forte is slightly less intense, with a rating of nine on the Intensity scale. For this blend, Arabica beans from Mexico are mixed with Robusta beans from Asia to produce a very smooth flavour. The Tarrazu Forte capsules have the lowest intensity of any of the capsules in this pack with a rating of 8 out of 10. This blend is made with Arabica beans that are grown in one location- the Tarrazú region of Costa Rica. Described as racy bold and spicy, these capsules provide a taste that is rich smooth and fruity. This variety pack has four different blends in it and since most of the packs in this comparison offer only three blends, the Gourmesso bundle offers a little more variety. With the Tarrazu Forte capsules only including beans from one location in Costa Rica, this pack will interest buyers who like single origin coffees. With all of the coffee in this pack being certified as Fair Trade, this pack will attract the conscientious buyer who wants to buy ethically. 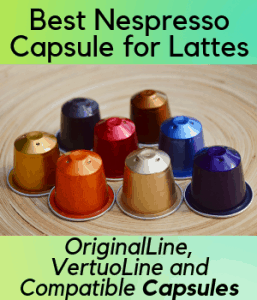 Vertuoline Nespresso machines are different in three main ways from Original Line Nespresso machines. Firstly, the Vertuoline range uses barcodes which means that only official Nespresso capsules for Vertuoline will work in the machines. There is no third party or Nespresso compatible with capsules. Secondly, whereas Original Line machines use a pump to extract the coffee, Vertuoline machine extract the coffee via a high speed spinning process. Thirdly, Original Line capsules are cheaper than Vertuoline capsules. In contrast to the packs that I have listed above, this pack of thirty capsules has only one blend in it. The blend is a split roasted pack of Guatemalan Robusta beans and Mexican and South American Arabica beans. With a rating of 9 on the Nespresso intensity scale, these coffee grounds are dark roasted and provide a very dense flavour with an after taste that lingers for a long time. One of the most prominent flavours that comes through is caramel. Well remember that you need a Vertuoline Nespresso coffee maker to use with these capsules. This pack of coffee is perfect for loyal Nespresso fans. You have the Nespresso coffee machine and you like the quality and the sense of security that their own brand coffee brings. It is also a great choice for the huge number of people who like consistency- drinking the same great cup of Americano everyday. And, it has to be said, the Intenso blend is for lovers of really strong coffee, a coffee that has lots of flavour and flavour that stays on the tongue. Stormio is made from 100% Arabica beans from Nicaragua and Guatemala. With a rating of 8 on the Nespresso intensity scale, these coffee grounds are dark roasted and provide a taste and flavour that is spicy, woody and cereal like. I think that this pack will appeal to some of the same types of people that like the Intenso pack described above. And to finish, this pack will be perfect by Arabica bean “fans”- those drinkers who in an ideal world would not use any other type of coffee bean.